We are now using the Noritsu D1005 HR, a duplex printer that has all the features of the D1005, plus a new maximum resolution of 1440 dpi. The D1005 HR is a high-efficiency, small footprint duplex dry minilab engineered to meet the changing photo imaging needs of today’s social expression age. 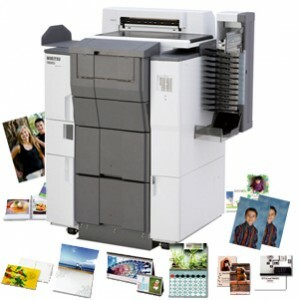 It produces an unprecedented range of services and photo products in sizes up to 12-by-36 inches. The system produces durable, archival prints with the Noritsu four color dye ink system that uses six gradations per dot and a specially formulated, fade-resistant ink designed to withstand ozone and light. AccuSmart image processing technology, only available from Noritsu, provides image optimization and correction functions that work automatically to produce high quality results. This model’s 1440 dpi improves the print quality, especially in terms of graininess and gradation. D1005 HR 1440 dpi prints have outstanding contrast, chroma and depth. The D1005 HR supports both roll paper and sheet paper, and has the ability to produce both single-sided and double-sided prints, allowing us to produce everything from standard prints to greeting cards, posters and photo books.